Sun Map 101: How to map without tools. So you’ve decided to start a new garden. Before you stick that shovel in the ground, you need to know how much light the area gets. This is done by creating a sun map. Each plant has different requirements that can be found on the seed packet or plant tag. If you’ve got a day off, grab a lawn chair, some margarita mix, and a good book and set up right where you intend to put your garden. Have a notebook handy and when the sun starts shining on you, jot down the time. When the sun is no longer shining on you, jot down the time. From there you can calculate the hours. You may want to spend a weekend doing this so you can compare results. Okay, I was totally kidding (well… maybe not TOTALLY, since that would work for creating a sun map). For those of us who haven’t got the luxury of lounging around in the yard for a day, you can still calculate your sun. 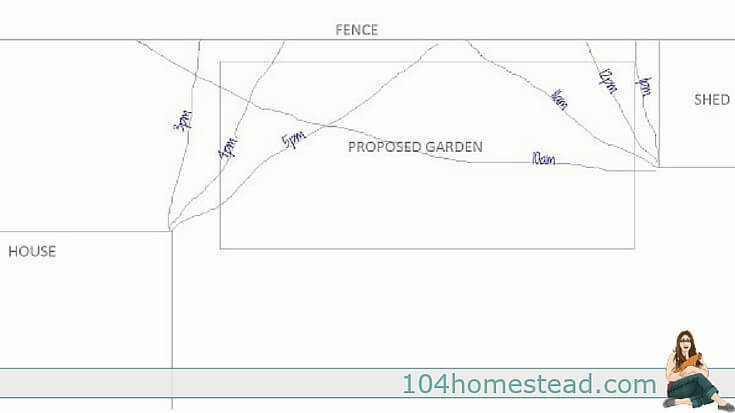 Draw a crude map of your proposed garden as well as any tall structures around it. These tall structures include trees, buildings or anything else that may cast a dark shadow. Pick a nice day to do you sun map. Cloudy days can make it difficult to identify shady spots. Start early in the morning when the sun is approaching the proposed garden area. Every hour draw a rough line where the sun is shining or shadows are cast with a note as to the time. Make sure you mark where the structures are casting shadows. Repeat this every hour until the sun is past the area. When you are finished, you will have something that resembles a topographical map but maps the sun on your property. It will show you when each area started getting the sun when it finished getting the sun and any breaks in between. Based on my sun map, I know that my corners don’t get as much sun as I’d hoped. The shed and the house cast shadows. The back right corner doesn’t get the sun until 1:00 pm. The back left corner starts getting shaded around 3/4:00. When planning my vegetable garden, I may want to put some more shade tolerant vegetables in those areas. The front of the garden gets plenty of sun, so it might be ideal for my fruiting vegetables. Have fun creating your sun map! 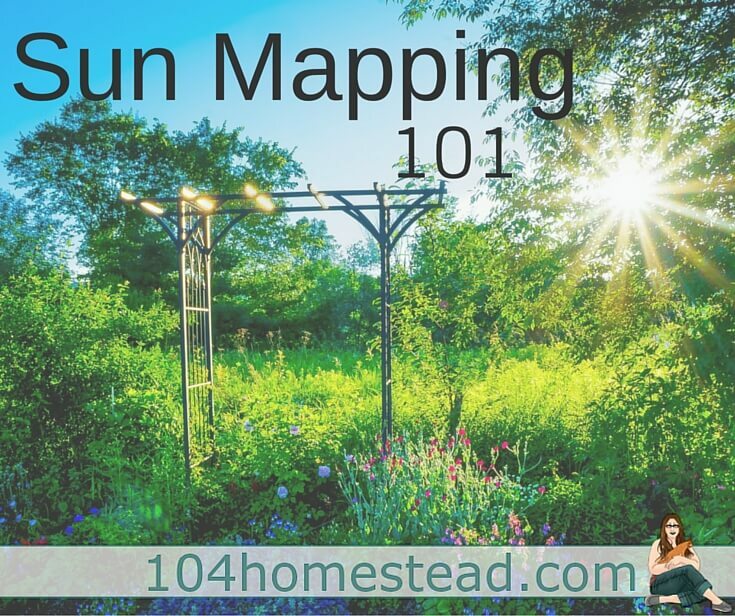 Home » Backyard Garden » Sun Map 101: How to map without tools. « What Is a Frizzled Chicken? Sizzled Chicken? It is easy to do and quite accurate. do you have to mark the cardinal points on your sun-mapping chart? 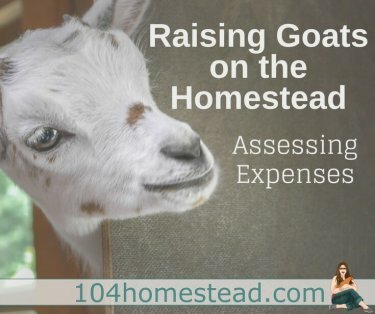 I don’t, but you might find it helpful if you have a large lot. I agree with sun mapping but it is also very seasonal so you would need one made for every month if the year at least. Yes, you definitely need to consider the seasons as winter light is much lower than summer light (plus, there are no leaves on the trees). Even start to finish of the growing season has different lighting. I need to re-evaluate the sunlight in my garden this year. The trees on the edge of property have grown and are shading the garden differently now. That is a great point Rachel! 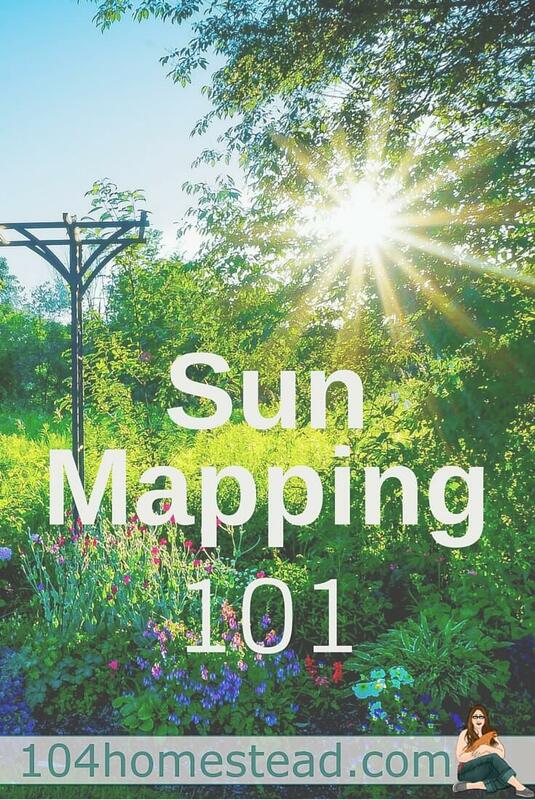 Sun maps are not just for new gardens. They should be used from time to time with established gardens as well. New structures and (as you mentioned) tree growth will alter shade patterns. Hi, I’m 13 and still in school. How can I create a sun map if I don’t have the money or time? I am heading out to my garden in the morning with my lawn chair. I will tell my family that I am researching how much sun our garden is getting! All jokes aside, this is a great idea for a new garden spot. Who really knows how much sun a particular area gets? Nice writeup! In designing a new system, I also always do other sector analyses in addition to sun – like water, wind, views, wildlife, etc. And a Zone analysis that helps me decide what to plant where. Solar sector analysis is definitely one of the biggies though! What an over achiever. It’s fabulous. I prefer the lawn chair approach. If my feet are getting damp, I make note of moisture issues. If my book pages are blowing, I make note of wind issues. K.I.S.S. If you drink enough tequila, you can observe what it would be like to have two trees planted in that spot where you normally see one. I really need to do this with our yard at the new house. We have lots of shade. I’m surprised they don’t have an app for this too! (well, I didn’t really check) Amusing how people need to purchase a kit to notice where the sun is.